>> Does Microblading Leave Scars or Keloids? Before we talk about whether or not microblading leaves scars or keloids you need to understand exactly what microblading is. The short answer is that microblading, if done correctly, should never leave a scar. The short answer to whether or not microblading causes keloids are more complex, but the general answer is that it probably doesn't but it might (so beware). For the in-depth answers please see below, but before we talk about those let's discuss microblading basics so you can walk into your procedure without any questions. Microblading is really a superficial type of procedure. This means that microblading is predominately done in the superficial (or top) layers of the skin. *Note: Example of keloid on the skin after trauma (notice how the scarring is larger than the initial trauma). The majority of the work in microblading is done in the epidermis, which is the top 7 layers of the skin. The goal of microblading is to cut the skin down the dermal-epidermal junction and place the pigment in this area. Scarring really isn't seen until the dermis is broken. When you have a deep cut, and it bleeds a lot, and you see tissues like fat or blood vessels, then there is a good chance that your cut will leave a scar. The reason for this has to do with how the body heals and what is required to put the skin back together. As long as you only enter the top layers of the skin no scarring will take place. One way to know if your microblader is only in the superficial layer of the skin has to do with the amount of bleeding you see during the procedure. Microblading should NOT result in significant bleeding because most of the blood that makes it to the top layer of the skin occurs through diffusion. A tip-off that your artist is going too deep is if you are bleeding excessively during your procedure. The answer to this question is that microblading should not leave scars. The first is if your artist goes too deep during the procedure (this one is usually obvious and very easy to avoid). And the second has to do with some complication, such as an infection, that occurs AFTER the procedure. Infections can cause local inflammation and increase the damage done to the surrounding tissues or skin cells. 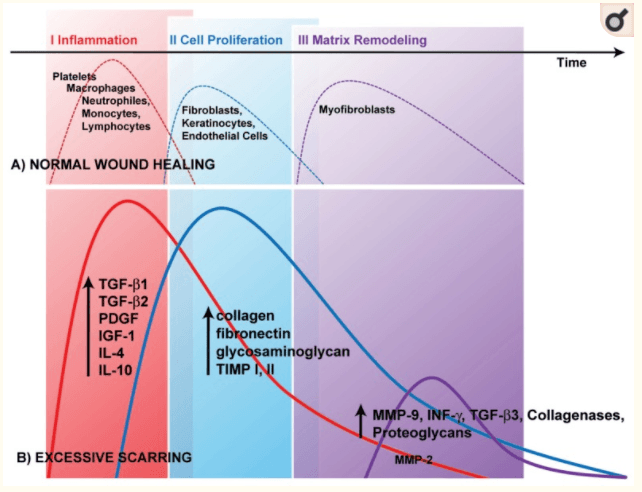 If the inflammation is great or if the infection spreads deeper into your skin, then the risk of scarring increases. This complication is VERY rare and does not happen very often. We are talking probably only 1 in 10,000 people will experience scarring after microblading - this is an exaggeration, but you get the point. Should you get Microblading done if you are Prone to Keloid Formation? 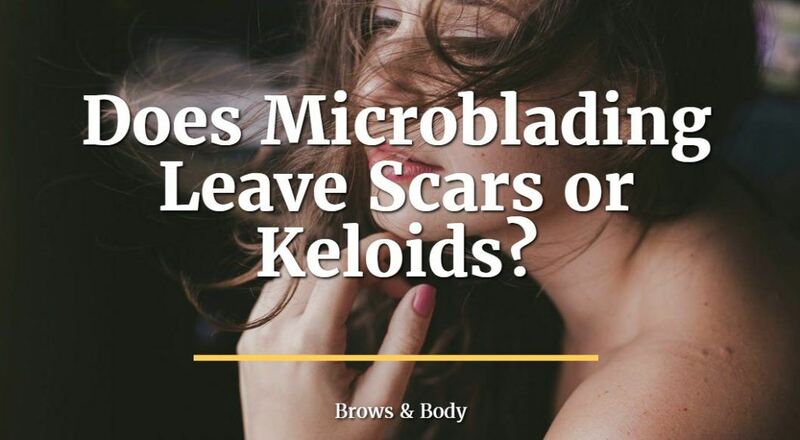 Another frequently asked question has to do with keloid formation and whether or not microblading will leave a keloid. But what is a keloid? A keloid can be thought of as an overreaction from your body to a cut or other damage to the dermis of your skin. If you're prone to keloids then you probably know what they look like, but if you aren't then you may not be aware of what they are. A keloid looks like large purple (or flesh colored) scarring over an area of a burn or cut. The keloid is often much bigger than the cut, burn or wound which caused the scar and that's the problem. Keloid formation often leaves certain patients with painful contractures of the skin and may leave some women feeling self-conscious (depending on where they occur). Does microblading cause keloid formation? There is a small, but real, chance that microblading may cause keloid formation, but only in those individuals who are prone to developing them, to begin with. 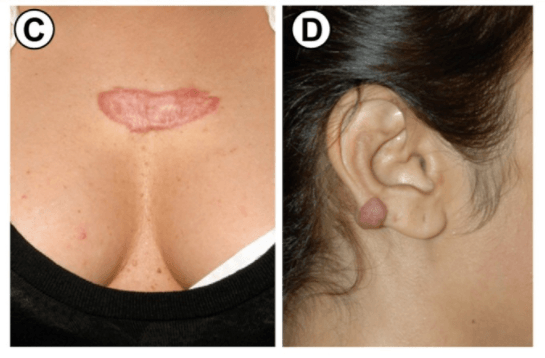 People who form keloids know that they do and will always ask prior to the procedure. Generally, keloid formation only occurs if the dermis is included in the procedure (or damage in the case of trauma) but it is still possible to cause a keloid formation from the procedure. My general advice is to avoid the microblading procedure if you are a known keloid former. It's generally better to be safe than sorry when it comes to dealing with your brows or anything around your eyes. If you are a keloid former then you can always use alternative methods to get your brows looking on point (such as make-up, etc.!). If you REALLY want to get microbladed AND you are a keloid former then just make sure you have your artist stay very superficial. You can probably get away without any issues by reducing the pressure during your cuts and staying in the very superficial parts of the skin. This will reduce the longevity of your results (meaning you'll have to get it done more often), but at least the keloid risk will be much smaller. When it comes to microblading it's so important for you to look for and find an artist who knows what they are doing. As long as your artist knows what they are doing, has plenty of experience, and knows to stay in the superficial layers of the skin then the risk of complications is very low. Scarring is not usually a problem with microblading unless something goes wrong with the healing process or if your artist goes too deep. Keloid formation, on the other hand, may be a reason to think twice about getting microbladed. While very rare, it's still a real risk and you should consider it before you get the procedure done. Are you worried about getting microbladed? Are you prone to scarring? Did you get the procedure already? Are you thinking about it?